This fine vintage advertisement for a 1964 ad for Black & Decker DeWalt Model 1100 Radial Arm Saw which is in very good condition but is slightly yellowed and measures approx. 6 1/4" x 9". This magazine advertisement is suitable for framing. 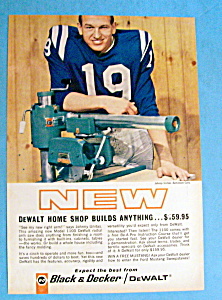 This vintage magazine ad for Black & Decker Saw depicts "Johnny Unitas from the Baltimore Colts".